At the time of Jesus, the Jewish law required several “cloths” to be used for burial, and as many as six for someone who had died a violent death. Christian tradition has preserved six cloths as relics that are associated with the burial of Jesus – 1.) The Shroud of Turin, 2.) the Sudarium of Oviedo in Spain, 3.) The Sudarium Veil of Manoppello, 4.) The Sudarium of Kornelimunster in Germany, 5.) The SindonMunda of Aachen, Germany, 6.) The Cap of Cahors in France. Three of the cloths in particular stand out as extraordinary “witnesses” to the Passion, Death, and Resurrection of Jesus, and together they bear a powerful testimony to the truth. They are: The Sudarium of Oviedo, The Shroud of Turin, and the Sudarium Veil of Manoppello. The remarkable relationship between these three “cloths” leave little doubt that each came in contact with the same man at the time of burial. First Witness – The Sudarium of Oviedo directly touched Jesus’s head following His Crucifixion. Blood was considered sacred to the Jews, so this cloth was used to soak up the Precious Blood of Jesus, by wrapping it around Jesus’s Head, as He was taken down from the Cross. The largest bloodstains are from the nose, other stains are from the eyes and other parts of the face. There is also an imprint on the sudarium of the hand of the person who held this cloth to Jesus’s Face to staunch the flow of blood. It takes one’s breath away to see that the bloodstains on the Sudarium of Oviedo, when overlaid with the Face on the Shroud of Turin and the Sudarium Veil of Manoppello, correspond perfectly. The blood type is AB, the same as on the Shroud of Turin. 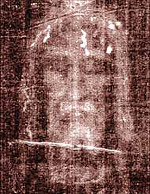 Second Witness – The Shroud of Turin; the sindone, or linen burial shroud, was believed to have been used to wrap the entire body of Christ. It is the most famous and studied of the three cloths. 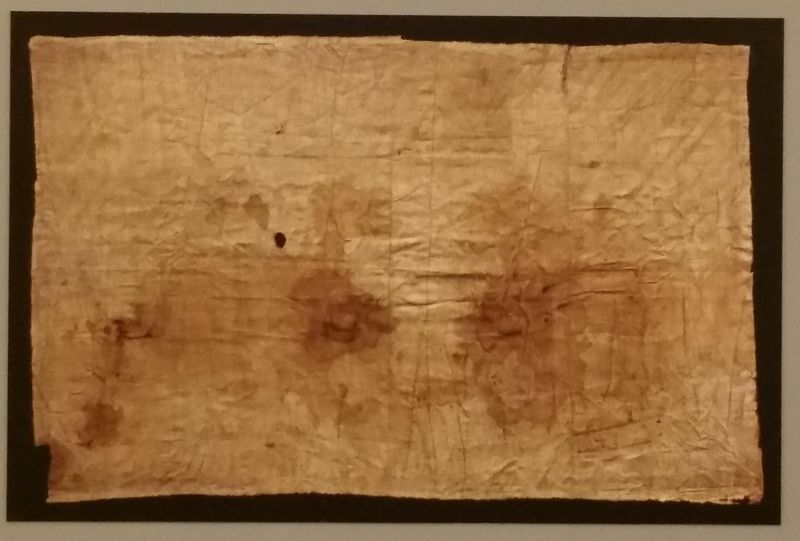 The faint but visible imprint on the Shroud of Turin gives witness to the violent torture of a man as described in the Passion and Death of Jesus in the Scripture. 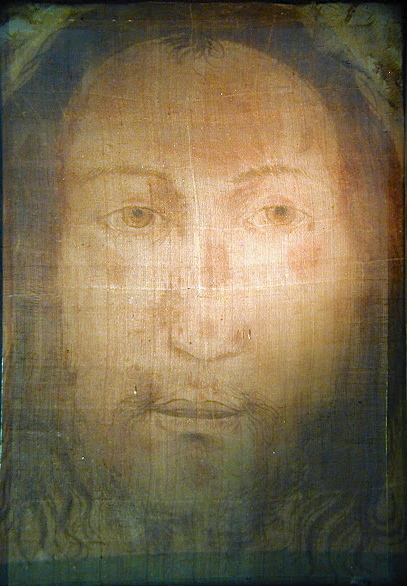 The world was amazed when Secondo Pia first photographed the Face on the Shroud in 1898; the negative of the photo incredibly became visible as a positive image. The Shroud of Turin caused an entire branch of science to be dedicated to its research called Sindonology. The most recent research was Atomic resolution studies that detected new biological evidences on the Shroud of Turin — the results of which are absolutely stunning. 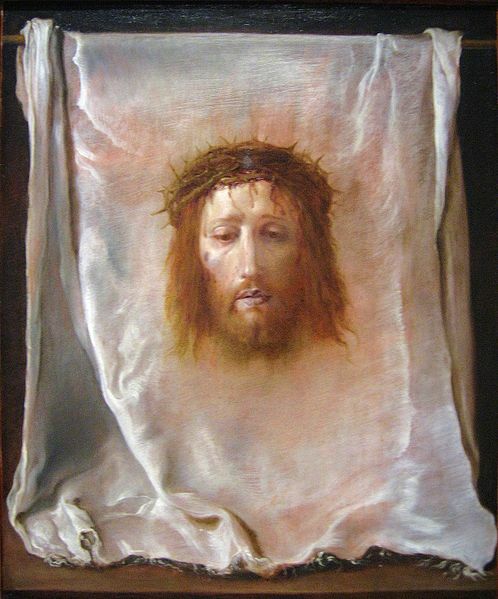 Third Witness – The Sudarium Veil of Manoppello, Italy, is perhaps the least known of the three burial “cloths.” The Veil bearing a miraculous image of the Face of Jesus, “not made by human hands,” was protected and hidden in an isolated church in the Abbruzzi Mountains for centuries. It seems, however, in recent years that Divine Providence has intervened to bring this third witness to light. It is believed not only to be the “cloth” that covered the Face of Jesus in death, but is also said to bear the image of the Face of Jesus at the moment of the Resurrection. Funeral of Pope St. John Paul II, Archbishop Dziwisz covers the pope’s face with a veil. An explanation about the tradition of a face cloth for burial may be helpful in understanding its profound significance. In the funeral rites for priests in some Eastern churches, the veil which was used to cover the chalice and paten were placed on the face of the deceased priest. (The cloth used to cover the chalice and paten had a particular liturgical symbolism linked to the Face of Christ as well.) It was done as a symbol of both the strength and protection of God, and also of the tomb of Christ–an expression of belief in the Resurrection. In Jewish burial custom, a deceased priest’s face would be anointed with oil and then covered with a white cloth, and would have been done for Jesus. 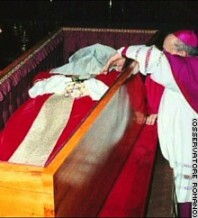 When Pope St. John Paul II was being laid in his coffin, Archbishops Marini and Stanley Dziwisz had the honor of placing a white silk veil over the face of the pope. Poignantly, the choir sang the words from Psalm 42, “My soul thirsts for God, the living God; when will I come and see the Face of the Lord?” Many wondered about the action of covering the pope’s face with a veil because this was the first time it had been done, but was at the request of Pope John Paul II, who had dedicated the millennium to the Face of Christ. The cloth that would cover the Face of Christ would have to be made of a material fit for a King, a High Priest, and a God. Byssus, mentioned in the Bible forty times, also known as “sea-silk,” is more rare and precious than gold and it has an exceedingly fine texture which can be woven. Made from the long tough silky filaments of Pinna Nobilis mollusks that anchor them to the seabed, it is strong enough to resist the extreme hydrodynamic forces of the sea. Byssus has a shimmering, iridescent quality which reflects light. It is extremely delicate, yet strong at the same time. It resists water, weak acids, bases, ethers, and alcohols. Byssus cannot be painted, as it does not retain pigments, it can only be dyed; and then, only purple. It can also last for more than 2000 years. The Sudarium Veil of Manoppello is also made of rare, precious, byssus silk. The skill needed to weave a byssus veil as fine as the Veil of the Holy Face of Manoppello is exceedingly great. 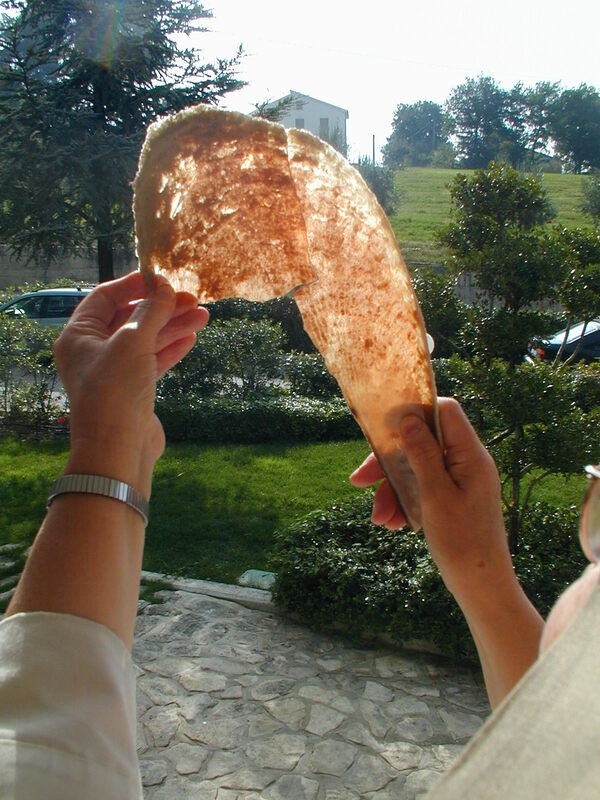 Chiara Vigo, known as “the last woman who weaves byssus,” has said that neither she nor anyone alive today could duplicate the gossamer-thin veil, which is sheer enough to read a newspaper through. The weave is so delicate, she says, that only the nimble fingers of a very skillful child could weave something so fine. 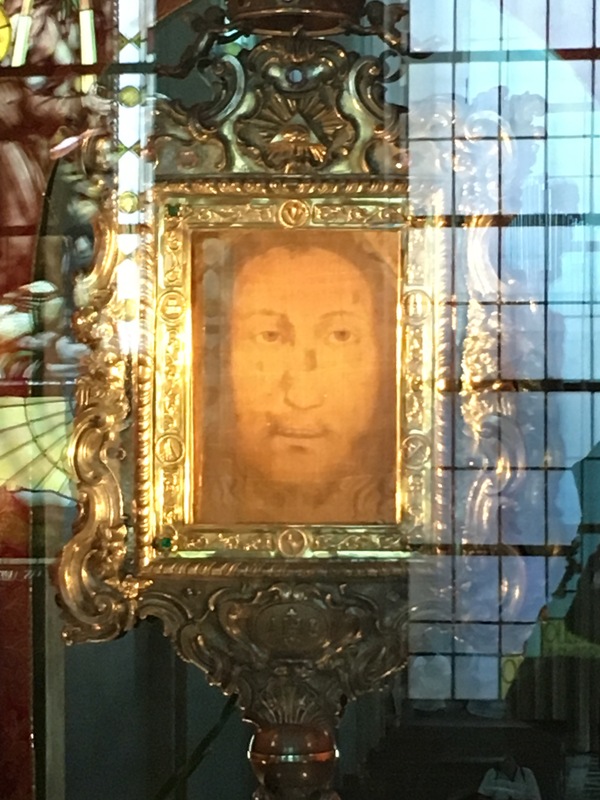 While the Face on the Shroud of Turin clearly shows the Face of Jesus in death with eyes closed, the Sudariam of Manoppello has eyes open–bearing witness to the Resurrection. That was the ardent belief of the former Rector of the Basilica Shrine of the Holy Face, Servant of God Padre Domenico da Cese. There are many physiological reasons too for believing that the Face Cloth captures the first breath of the Resurrection. 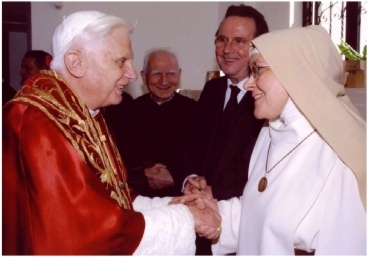 Sr. Blandina Paschalis Schlomer, who shares that belief, has provided meticulous research about the Veil in her book JESUS CHRIST, The Lamb and the Beautiful Shepherd, The Encounter with the Veil of Manoppello. Sr. Blandina together with Fr. Fr. 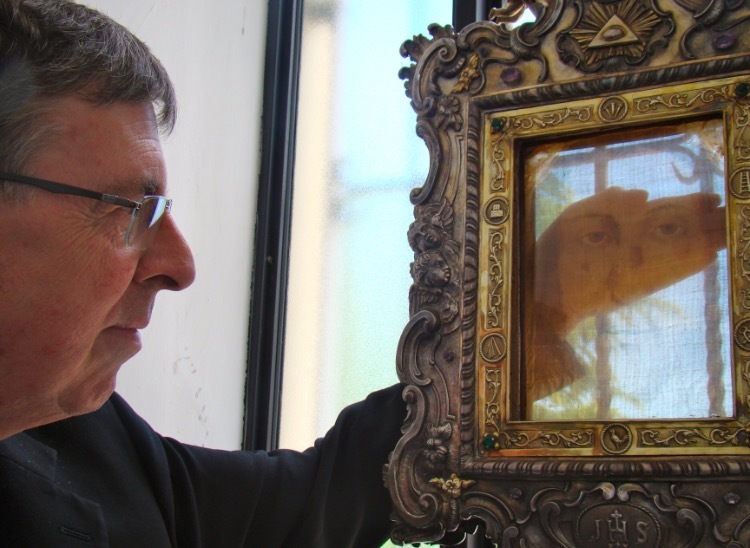 Heinrich Pfeiffer, S.J., Professor at the Pontifical Gregorian University in Rome, have each demonstrated that the Holy Face on the Veil of Manoppello is the proto-image of the earliest icons, and other works of art depicting the Face of Jesus. What did St. John see in the tomb that would cause him to believe? A cloth of blood, such as the Oviedo? The Shroud of Turin? It is a miraculous image, but shows the Face of a dead man. A third witness was needed in order for the disciple to believe. It could only have been evidence of something as astounding as the Resurrection; proof that Jesus was alive! The word “veil” can have many meanings. A veil can cover the face, the head, or an object; it can cover, conceal, or separate. In ancient Jewish tradition a veil in the Holy of Holies in the Temple separated sinful man from the presence of God dwelling in the midst of His People. The holiness of God was not to be taken lightly. The blinding light of the purity and glory of the Face of God could not be looked upon by sinful eyes. But when God chose Mary to be the Mother of His Son He created her to be all-pure and sinless from the moment of her conception through the merits of her Son, Jesus. In Matthew 5:8 we read, “Blessed are the pure of heart, for they shall see God.” What was to prevent Mary, the Immaculate Conception, who was free from all sin, from seeing the Face of God in all His glory even while she was still here on earth? The answer is, in a word, a veil. When the Word of God became flesh in the womb of the Blessed Virgin Mary, at the Incarnation, Mary became His Tabernacle. Jesus’ human flesh was His veil: “by the new and living way he opened for us through the veil, that is His flesh” (Heb. 10:20). The Angel Gabriel told Mary that she would be the mother of the Son of God. But Mary, though “full of grace” and all-pure, would only gaze upon the human face of her child and upon the Face of her God through the veil of faith. In a truly heroic manner, in poverty and suffering, on her whole pilgrimage or journey towards God, Mary believed, in faith, though everything happening around her seemed to contradict God’s words to her: That “the Lord will give to him the throne of his father David.” And that “He will reign over the house of Jacob forever and of His kingdom there will be no end.” Mary believed these invisible truths about her Son, even as Jesus, suffered and died, hanging on the Cross. What was visible on an earthly level did not reflect the heavenly reality. Mary did not necessarily see her Son radiant in glory or angels ministering to Him in His Passion. At the foot of the Cross she saw His bruised and bloodied suffering Face. In this earthly pilgrimage of faith a veil lies over our hearts, as St. Paul writes: “To this day, in fact…a veil lies over their hearts, but whenever a person turns to the Lord the veil is removed… All of us, with unveiled face gazing on the glory of the Lord, are being transformed into the same image from glory to glory, as from the Lord who is the Spirit.” (2 Cor. 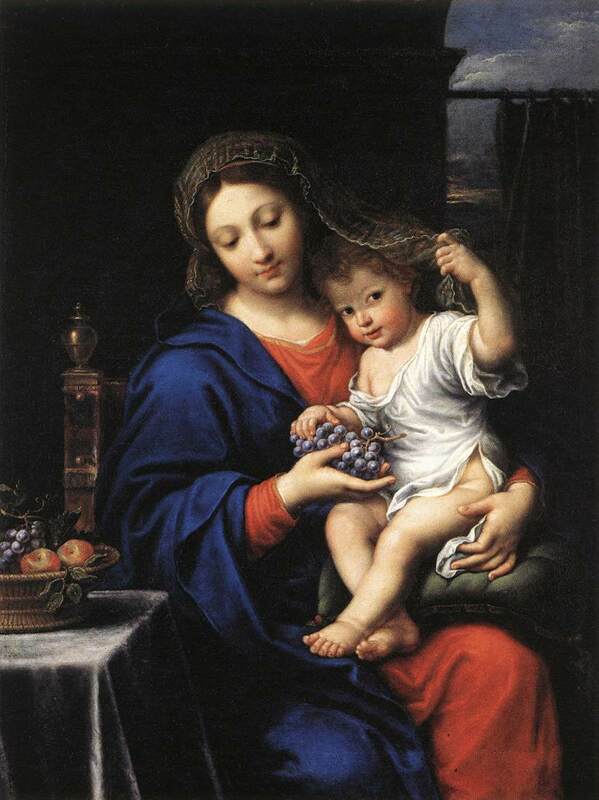 4:15-16, 18) As members of the Church, we can “look at” Jesus through Mary’s eyes of faith, in the Eucharist, in our neighbor; believing in His Word and following her example in our pilgrimage towards the Father until that time when the “veil” of faith will be finally lifted.
. . . Your Face, Lord, do I seek! Hide not Your Face from me! In fact, the Hebrew term, “panim”, which means “face” means to see the Face of God or the presence of God, occurs 400 times in the Old Testament, and 100 of these refer to God. The same word “panim”, Pope Benedict explains, is a term that describes relationships. The word “shem” meaning “name” is also a term of relationship. God has a face and a name! How do we seek His Face? The revelation of the face of God took on a new and beautiful manifestation when God became man in the person of Jesus Christ. As fully God and fully man, Jesus Christ gave us a human face that revealed the face of God. “While we too seek other signs, other wonders,” Benedict XVI explains, “we do not realize that He is the real sign, God made flesh; He is the greatest miracle of the universe: all the love of God hidden in a human heart, in a human face!” Something new happens at The Incarnation, because now God’s Face can be seen: The Son of God was made man and He is given a Name, Jesus. The expression “Name of God” means God as He who is present among men. His Name is a concrete sign of His Existence. Because of the profound connection between our relationship with God and His Name and Face, sins committed against this relationship with Him are reflected in the Face of Christ. When a man’s name is slandered or reviled, those insults are reflected on his face. So too, in the Passion, the Face of Our Lord was beaten, bloodied, bruised, spit upon. How are our sins against our personal relationship with God revealed in His face? The manifestation of our sins on His Countenance come about through blasphemy, atheism, disrespect of God in Sacred Things, the profanation of Sunday, hatred of God’s Church. These indignities suffered by Our Lord in His Face represent the most serious sins, because they are against God Himself. The damage done by our sins to our relationship with God are reflected in the Face of Jesus Christ. For this reason, devotion and reparation to the Holy Face is fitting in order to make amends for what we have done to Him. Devotion to the Holy Face has existed since the beginning of the Christianity. For instance, the “Veil of Veronica” and other images, such as the Shroud of Turin and icons in the East, have been particular objects of devotion to the Face of Christ. 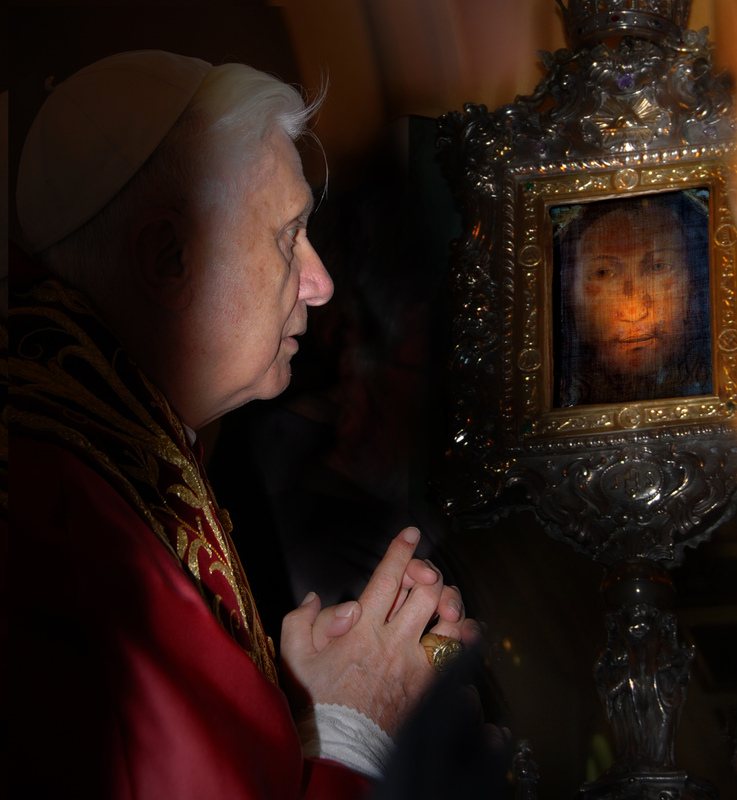 The “Beautiful Work” referred to by Our Lord in this apparition is devotion to the Holy Face. This “Most Beautiful Work under the Sun,” spoken of by Our Lord, has dawned at the New Millennium. 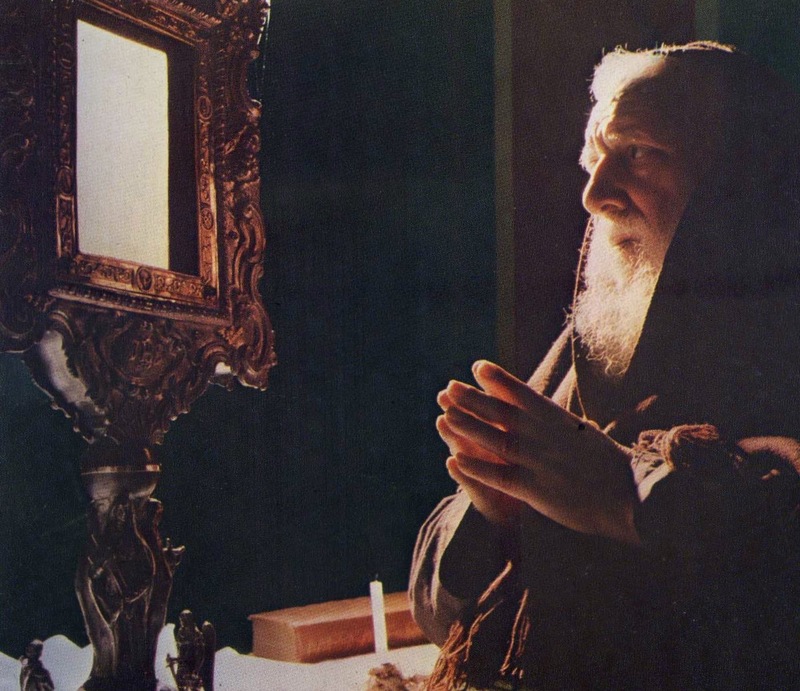 Through the inspiration of the Holy Spirit, begun by St.. Pope John Paul II in his last days, devotion to the Holy Face is spreading, and the Face of “The True Sun, Jesus Christ” is beginning to “Shine” in the world. While we are gazing at God, He is gazing at us. St. John of the Cross says the gaze of God is active, “for God’s Gaze is to love and to work favors. His Gaze is love and love does things. God’s Gaze works four blessing in the soul: it cleanses her, makes her beautiful, enriches her and enlightens her . . . making her like Himself.” By this mutual gaze of love between the Face of God and the soul of man, God restores His Image in our souls. We enter into this mystery, not by our own efforts, but by faith, grace, and by contemplating Him in silence and prayer, and by anchoring ourselves firmly in the Scriptures, contemplating His Face hidden in the womb of the Blessed Virgin Mary, and on through His Life, Death and Resurrection. Which Image of the Face of Jesus? There are many images of the Face of Jesus, but the image of the Face of God is not confined merely to images of Him beaten and bloodied by his passion. St. Pope John Paul II states, “We cannot stop at the image of The Crucified One. He is the Risen One! 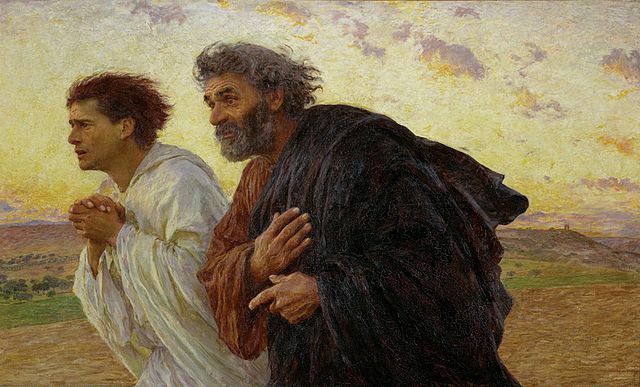 As St. Paul remarks, the Resurrection is fundamental to the Christian’s relationship with God: if God were not risen, “our preaching would be in vain and our faith empty.” (cf. 1 Cor 15:14) During different seasons of the Church and moments in our faith journey we may feel drawn to contemplate the various aspects of The Holy Face of Jesus from his Incarnation in the womb of the Blessed Virgin Mary, through His Life, Passion, Death and Resurrection. Carrying out St. Pope John Paul II’s “program” at the beginning of his Pontificate, Pope Benedict made a pilgrimage to the little mountain village of Manoppello, Italy, to venerate a veil with a miraculous image of The Face of The Risen Christ. The veil, which has been described as a “living image” due to its changing appearance, also known as “Il Volto Santo,” has been recently “re-discovered”: research reveals it to be the prototype of ancient images of Christ in both the Eastern and Western Church. 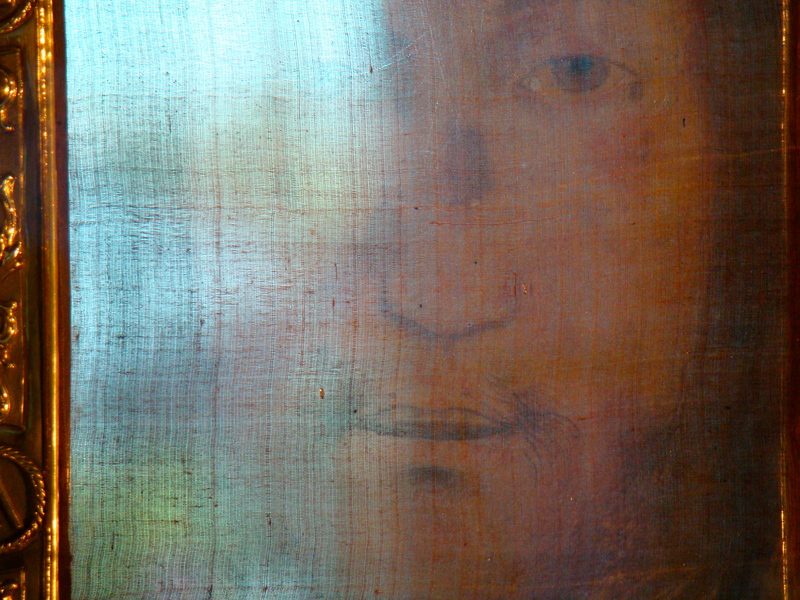 The face on veil forensically matches the Face on The Shroud of Turin. It is believed to be the “Veil of Veronica” which most likely disappeared or was stolen from the Vatican in the 1500’s. 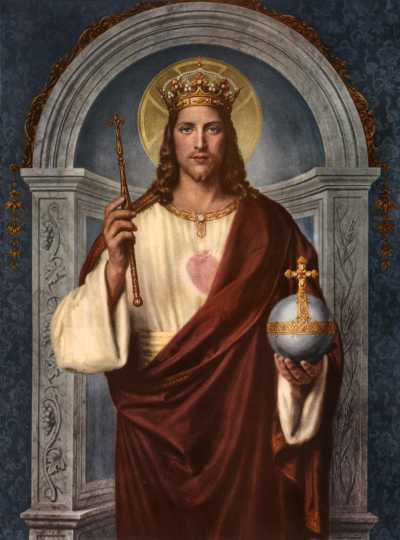 Moreover, Pope Benedict wrote, “To rejoice in the splendor of His Face means penetrating the mystery of His Name made known to us in Jesus, understanding something of His interior life and of His will, so that we can live according to His plan for humanity. Jesus lets us know the hidden Face of The Father through His human Face; by the gift of The Holy Spirit poured into our hearts.” This, the Pope says, is the foundation of our Peace, which nothing can take from us. 1. Discipleship – an encounter with Jesus, to see Jesus in the Face of those in need. 2. 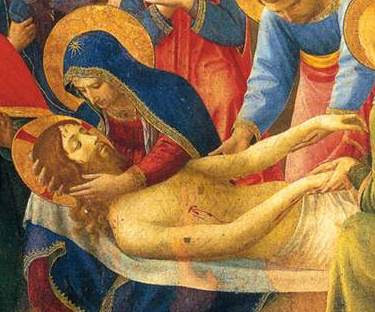 The Passion of Jesus, and suffering expressed by images of the wounded Face of Jesus. 3. The Eucharist, “the great school in which we learn to see The Face of God”, which is woven between the other two. The eschatological element then builds on awakening to Christ by contemplating His Face hidden in The Eucharist. 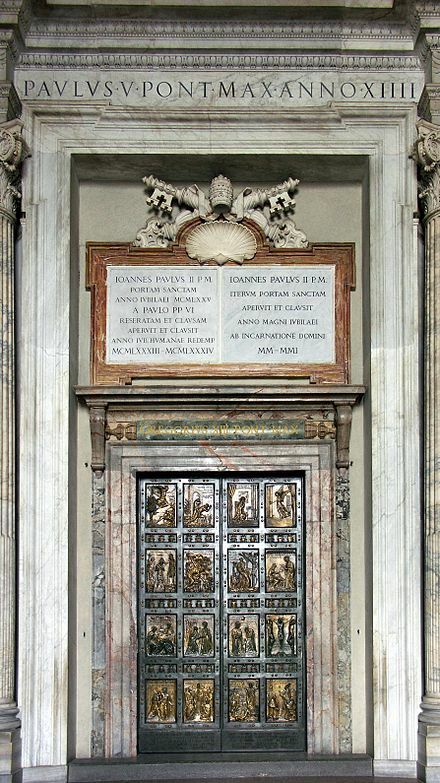 Indicating that he is truly the Pope of the Face of God, Pope Benedict’s last action as Pope was to request the Ostentation of the Shroud of Turin on Holy Saturday. From the beginning of his pontificate, Pope Francis has followed in the footsteps of Benedict XVI and St. Pope John Paul II by speaking often of the importance of the Face of God. Before all, Pope Francis seems to be imitating his patron St. Francis, in letting his actions speak, by demonstrating “Discipleship” seeking out the Face of Christ in the poor, the sick, and the weak and by BEING The Face of Christ to the poor, the sick and the weak. In Pope Francis’ first homily he tells us, “The Face of God is like that of a merciful Father that always has patience and is willing to forgive.” “All of us have felt joy, sadness and sorrow in our lives,” Pope Francis reflected. “Have we wept during the darkest moment? Have we had that gift of tears that prepare the eyes to look, to see the Lord?” Here we see the need for repentance. The Face of God has, in fact, become a theme, which Francis has returned to again and again in his preaching. 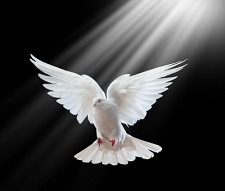 On Trinity Sunday 2013, Pope Francis explained the Holy Trinity is not the product of human reasoning, but the Face with which God has revealed himself, walking with humanity. Section 37 of Lumen Fidei speaks of the effect of contemplating The Face of God and how by it, we are transformed into His Image. “Those who have opened their hearts to God’s love, heard his voice and received his light, cannot keep this gift to themselves. Since faith is hearing and seeing, it is also handed on as word and light. Addressing the Corinthians, Saint Paul used these two very images. On the one hand he says: “But just as we have the same spirit of faith that is in accordance with scripture — ‘I believed, and so I spoke’ — we also believe, and so we speak” (2 Cor 4:13). The word, once accepted, becomes a response, a confession of faith, which spreads to others and invites them to believe. Paul also uses the image of light: “All of us, with unveiled faces, seeing the glory of the Lord as though reflected in a mirror, are being transformed into the same image” (2 Cor 3:18). It is a light reflected from one face to another, even as Moses himself bore a reflection of God’s glory after having spoken with him: “God… has shone in our hearts to give the light of the knowledge of the glory of God in the Face of Christ” (2 Cor 4:6). A Great gift to the Church – The Most Beautiful Work under the Sun! The Devotion to the Holy Face of Jesus is great gift to the Church; as Jesus said, “The Most Beautiful work under the Sun”; the “program” set before the whole Church to follow for this millennium by Bl. John Paul II, continued by Pope Benedict XVI and now being carried out by Pope Francis: to contemplate the Face of Christ, with Mary, by grace, in Faith, silence and prayer. To seek Him everywhere: in the Scriptures, our neighbor by Discipleship, and most importantly in contemplating His Holy Face in the Eucharist. By carrying out our part of “the program” we hope to obtain the “most sublime gift of God”: His peace. This is “the beautiful work” which will bring about the Transformation of the Church, restoring the Splendor of the Face of Christ to His Mystical Body. May The Lord bless us and keep us, may He make His Face shine upon us and be gracious to us: May the Lord turn His Face toward us and give us His PEACE!